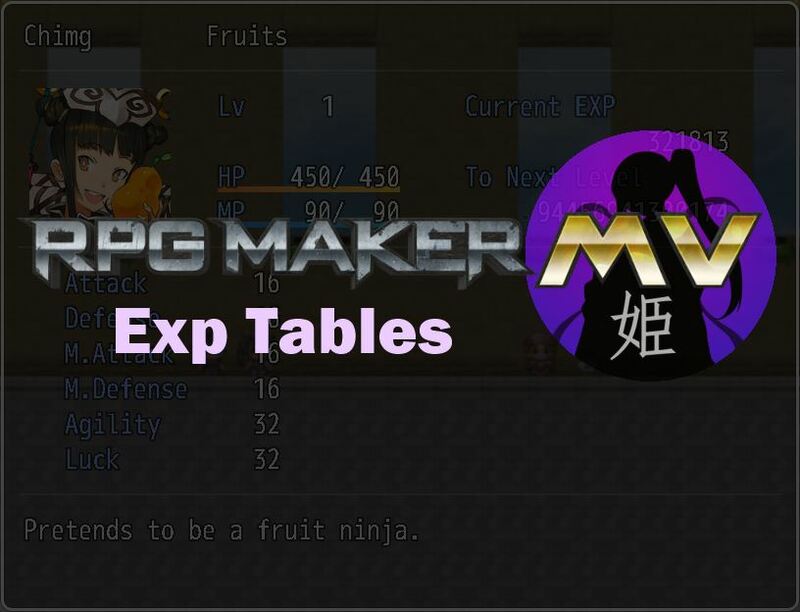 RPG Maker allows your actors to level up by reaching the amount of experience points required. The amount of exp required is determined by the actor’s level for their current class, and the class’ exp curve. Exp curves are generated using a pre-determined formula, and you only have the ability to adjust different parameters. In some cases, your desired exp curve is simply impossible to achieve with RPG Maker’s own exp curves. With this plugin, you have full control over exp values requires for each level. For example, if you wanted to make it so that every level required 1000 EXP, you could simply set the exp required at intervals of 1000, without having to figure out how to adjust the curve. You can manage your exp tables in a spreadsheet as well, allowing you to take advantage of spreadsheet software to manage your data. Download ths plugin and place it in the “plugins” folder in your project’s “js” folder. Then open your Plugin Manager (F10), double-click an empty row, and select the HIME_ExpTables plugin. In the plugin parameters, specify the names of the files that will hold your exp tables. If you don’t want to use one, leave it blank. Start by downloading the “template” CSV file that provides a sample exp table for the first 4 actors. The first row consists of the headers. This file is only for actors. Each actor is specified by writing “Actor”, followed by their ID. Each row after indicates the level, and how much exp is required for each actor. Each value represents the total exp required to reach that level. This means that from level 2 to level 3, 100 EXP is required. The first row consists of the headers. This file is only for classes. Each class is specified by writing “Class”, followed by their ID. Make sure that when exporting to CSV, there are no quotations in the file as it is not supported. I can’t seem to get the plugin to work at all. I have a .csv file named ActorExp in my data folder. In the parameters I have it set to look for the ActorExp file. Every time I open the game I’m given “failed to load: data/ ActorExp” error. This page is your best friend if you’re using formulas to calculate your rates. Kinda stupid simple, but then I found out that the plugin doesn’t read formulas, so I freaked out and found this. Leaving it here for your sanity. Yes, the plugin doesn’t support excel sheets. It only reads simple text files that happen to be supported by excel. Thank you for the script! I can’t get it working, though. I’ve added a class_exp.csv file to my data folder, and I know that it loads, because if I change its name the game gives me an error. But, the exp for next level is still based on the curve in the database. Any idea what I could be doing wrong? Stupid LibreOffice said it was saving the file as a .csv, but when I looked at it in Notepad++ the cells were actually separated by tabs. Thanks for the plugin, it’s a lifesaver! Yes, that is a tricky thing I have seen. So this is my first plugin. I set it up in the plugin manager, and i set the file location to the the corresponding exp table but whenever i playtest the game the exp needed does not change in the game. I’m at a loss on what to do. Any help would be appreciated. Press F8 to open the debug console. Does it show any issues? Uncaught TypeError: Cannot read property ‘trim’ of undefined. Check the filename of the plugin when you saved it. The name must be “HIME_ExpTables” exactly with .js extension. Ohh! I got it! I downloaded two of them and used the one called “HIME_ExpTables (1)”. Silly mistake I suppose. Thanks for the help, just great. I love this, want to use it, but I’m having a bit of an issue myself now. I’m only using Yanfly scripts, but I keep getting an error I can’t figure out. Set it up in this demo project, and if the same error occurs, send it to me. If it doesn’t occur, there may be a problem with the way it’s set up. This error usually means there is a problem with the way the data file is set up. but I cannot figure out where to save the file. When you check the plugin parameters, there is an option that tells you where the CSV file should be saved. You can also change where the file should be saved. By default it’s in your data folder. Is it possible to put this in the same folder as the tables for Parameter Tables? I made the table with 500 actors, the header names are all in the format “Actor#” and the json file is named ActorExp.json and placed in my games data folder, the plugin is at the bottom of the list, after not working towards the middle. Do you have 500 actors? The plugin assumes the EXP Tables will be assigned to actors that exist in the database. Is it possible to set this for classes instead of actors? Can you convert you Shared EXP VX Ace script to an MV plugin, provided you are both willing and able, the latter which should be child’s play considered what amazing plugins you were able to make? Hmm, distribute total EXP gained from battle equally among all alive members. This would reward players that decided to solo an enemy rather than bringing an entire party. Makes sense. I will provide a plugin for that. Failed to execute ‘createLinearGradient’ on ‘CanvasRenderingContext2D’: float parameter 3 is non-finite. Does it work without yanfly’s plugin? It looks like you’re specifying an invalid number somewhere. “Uncaught TypeError: Cannot read property ‘expTable’ of undefined” Can you please help me. Can you press F8 and take a screenshot of the error in the new window that pops up? It will provide more information. Thanks looking forward to hear from you. What are the header names that you used for each column? It seems like that might be issue. OMG..!!! Thank you for spotting that out.!! I checked what was wrong n changed the names. Now its working… yay…!! Ausome. Thanks a lot. I will have the game show a more useful error message to inform gamedevs what the error is. Hello Hime, this is truly helpful! Thank you. One question: Do you plan to do a “Classes Tables” for MV? I having a hard time finding a way of breaking the database stats limits (999) setting the parameter curve for each class. I need values like: 1,800 at lvl 1 then 36,000 at lvl 99 but I can’t find a way of doing it because the database menu can’t go over 999. I haven’t find a notetag in any script for doing that. At some point. I’m thinking about how to have it support custom parameters.